are proud to be celebrating their 25th anniversary this year. Since the group was chartered in 1991 there have been many changes with members, musical styles and teachers. Through the years the Belles have entertained numerous groups in Lake Havasu, Las Vegas, Laughlin, Palm Springs, Branson, and Nashville. Eileen Mannix is their professional teacher. They are an active, fun-loving group that would love to entertain you. Info: Bonnie Houghland (928) 453-7678 or Jo Black (928) 855-1499.
believes in high standards and yields impressive results. It is a comprehensive classical ballet training program for students from age four (pre-ballet) to adult, and up to pointeshoe level. A wide variety of enticing repertory is developed for performance purposes with an emphasis on beauty and form. Dancers have performed in full ballet costume both publicly and privately in Havasu for the last thirteen years. New dancers and students are welcome! 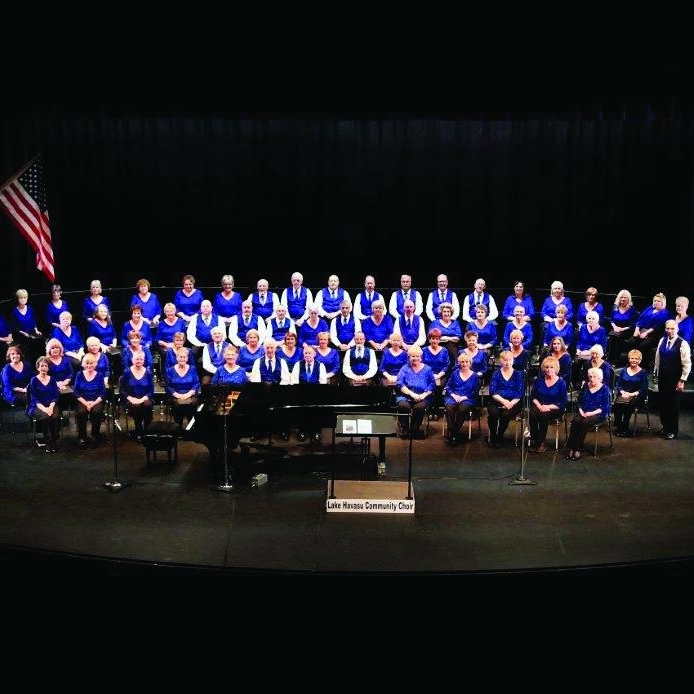 To join a class or book the ensemble contact Director/Choreographer Jeanne Fernando (928) 453-8337.
is an all-volunteer choir with a mission to provide members and audiences with quality choral entertainment. It is a 501(c)3 non-profit supported by ticket sales, donations and sponsorships. Rehearsals are Tuesdays at 6:00 pm at the LHHS Choir room, 2675 S. Palo Verde Blvd, beginning in September. The choir performs two public concerts each year, Spring and Winter, with two performances, one at 2pm and one at 5pm, at the Performing Arts Center at LHHS. Advanced tickets are $10 adult, $5 students and are available from any choir member, Scoops Ice Cream and Sound Bank Electronics. Adult tickets at the door are $12. is a nonprofit group, bringing New York entertainment to Lake Havasu City for 44 years. It is supported by ticket sales and local donors. Reserved-seat passes are only $70 for the five concert series. Single concert tickets are $25, students to age 18 are admitted free with school ID. Concerts begin at 7:30 pm at the Performing Arts Center at the LHHS Campus, 2675 S. Palo Verde Blvd. For season passes and advanced tickets call Bob 928-706-0779 or Conny 928-208-5143.
is a professional all-volunteer orchestra with a mission to add to the cultural climate of the region and to support the musical growth of young musicians through a scholarship program. We welcome all musicians of any ability to attend rehearsals which are Mondays at 7 pm at the LHHS Band Room, 2675 S. Palo Verde Blvd. Lake Havasu Symphonic Winds, Inc.
is a community band composed of 30 advanced level musicians of varied ages who share a love of playing music of all kinds. The conductor is Kimberly Wilson. The group rehearses weekly and presents several concerts each year at the Performing Arts Center on the LHHS campus, 2675 S. Palo Verde Blvd. General admission is $10 for adults, free for children and students. Concerts begin at 3 pm. The Winds is a 501(c)3 nonprofit organization supported by ticket sales, donations, and sponsors. is a square and round dance club that dances Thursday nights from 7 pm - 9:30 pm October through April. Square dancing is a terrific form of exercise, friendships, and just plain FUN. Dances are held at the Lake Havasu Senior Center, 450 S. Acoma Blvd., and include Mainstream and Plus, with Round dance between sets. The nightly fee is only $6 per dancer. A beginners class starts in January 2017. If you know your left from your right you can dance. All ages are welcome. For additional information, call Twila 928-453-7672.
is a Canadian Brass style ensemble. Its repertoire includes a wide variety of styles from classics to jazz. Community Presbyterian Church hosts the annual TOP BRASS concert each March. The group is also available for private and civic functions. Founder and Director Doug Los also produces the annual LHC Christmas Tubas Concert.